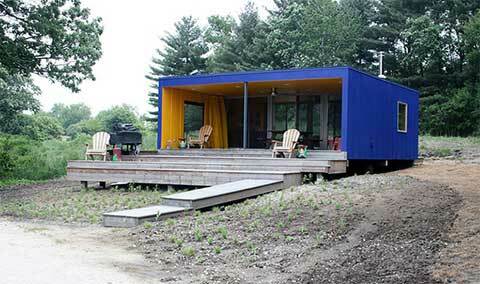 Located at Burlington, Wisconsin, the Manilow weeHouse is a prefab getaway-home with blue and yellow container sidings. Designed by Alchemy Architects, the weeHouse is a prefabricated, modular structure ranging from 341 sf studio and up to 2090 sf full home. 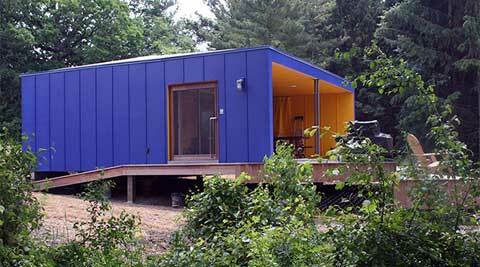 The Manilow weeHouse is a 28′ square two-module, prefab house. 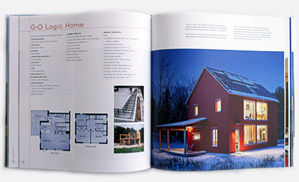 It consists of an open porch and an enclosed room with a wood stove and kitchen wall. 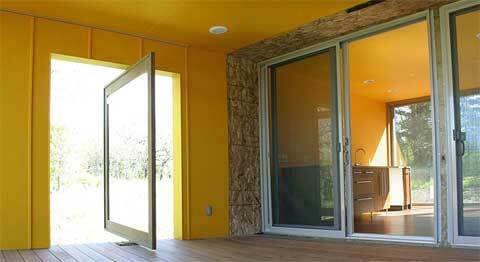 The porch features a custom pivoting ipe door, which i simply love, and a bug screen curtain with magnetic catches. A “folding” deck and dock in ipe and rubbed silver paint finishes the composition of this wonderful retreat. 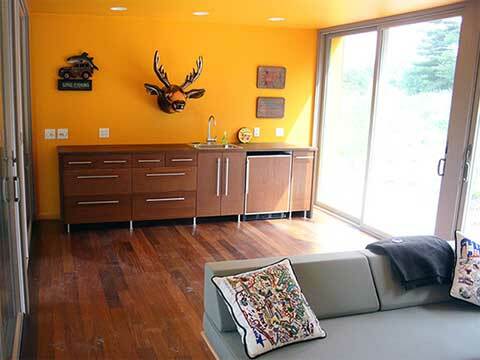 These modular home prices range from $65,000 to $255,000. 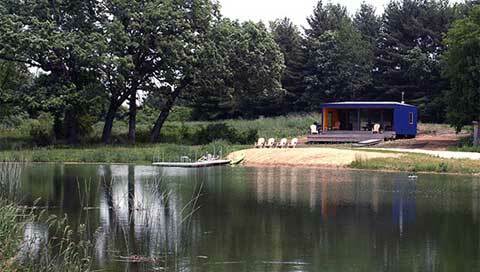 I’ve got some property in SW Wisconsin and this repurposing shipping containers like you have is an awesome idea. Can you tell me where you sourced yours? I’ve been looking into it and while the prices for the containers are reasonable, its the delivery costs that’s shocked me, any thoughts? My friend is interested in container architecture. We live in Wisconsin. Is there any possibility of arranging a tour of the home? 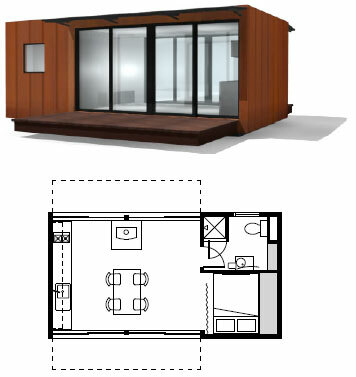 Modular Homes are great! I just love mine. See, whereas I could not afford to build a home the other way, I was still able to build a custom modular home. And because it was a modular home, I was able to customize it with all the features I ever wanted. Now my wife and I are living like kins and queens, and the kids love it too. We are in Pennslyvania, and used Simplex Homes, so if you are in PA (or I think any of the other Eastern US states) check them out. They were really easy to deal with, and like I said, I love my new modular home.